To manage auctions on your website you can go to the "Reverse Auctions List" section in the back end. 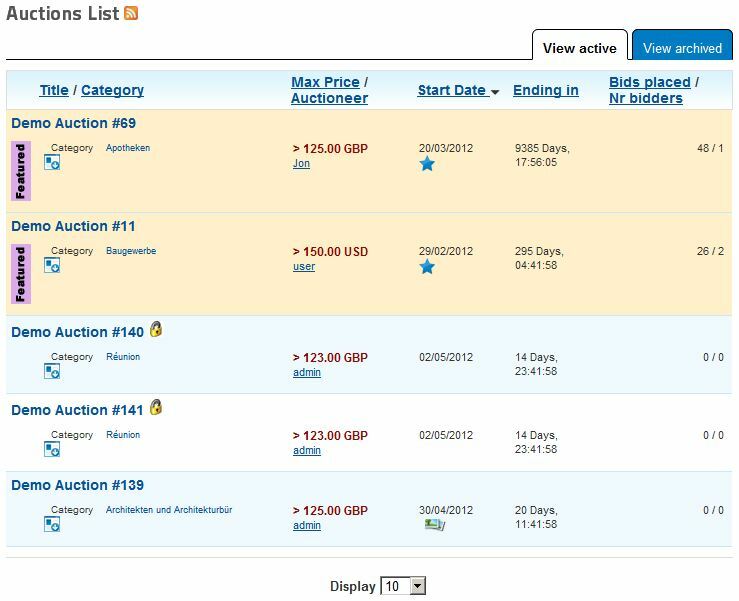 The auctions are displayed in a list with all the important information shown in columns. Multiple quick auction management features are present here; like the Approval Status(if Admin Approved listing is enabled), Published/Unpublished, Running/Closed and also Blocked. 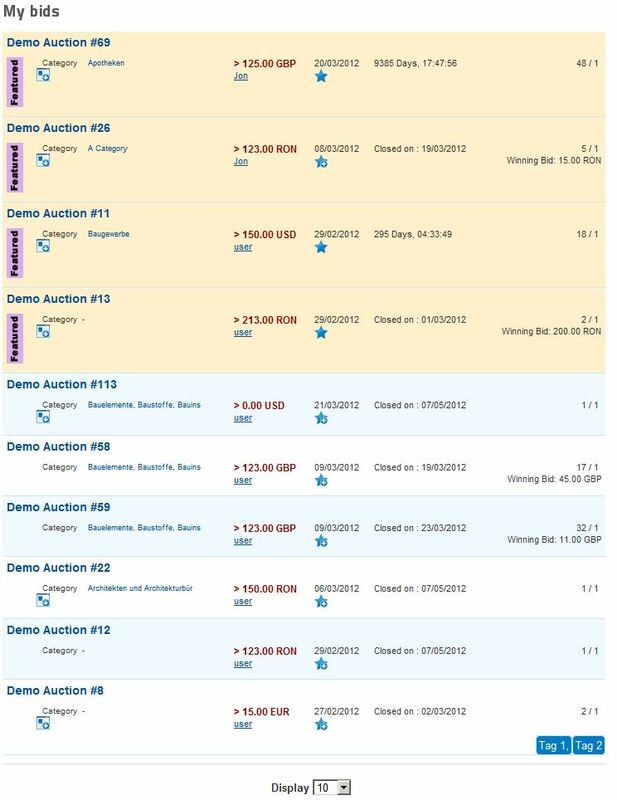 Each column displays useful information about each auction, bid prices, start dates, status, bids and allows you to block(ban) auctions with only a click. There is also an Auction Manager that allows you to filter auctions when browsing, you can enter a keyword and/or a username, browse by status along with sorting by each column. You can see the name of the auction and its poster, clicking on the name of the auction will take you to the auction page and clicking on the name will take you to the user details page. Here you can see all the fields shown on the front end and edit them. If the approval system is enabled, a banner will show for unapproved auctions. On the right you have more auction related details like auctioneer details, bid list and messages; all in a compact tabbed format. The Main auction list in the extensions, lists all published and active auctions on the site. When using the search, a filter is applied based on the search parameters. Current user's auctions, has separate tabs based on auction statuses. 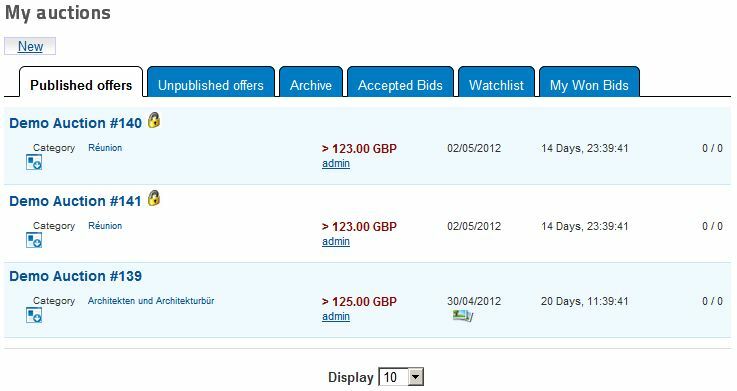 Lists the auctions on which the current user has bidded on.